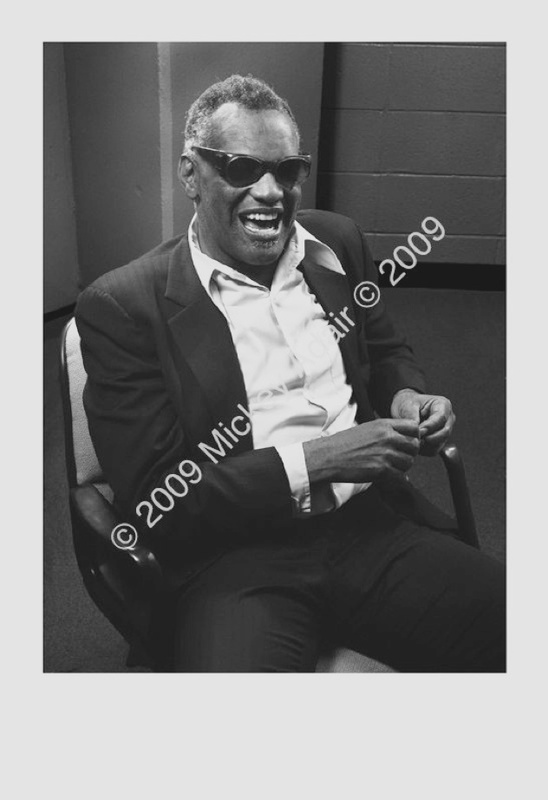 Ray Charles was a perpetual motion machine. After a 1982 performance at the Civic Center he “posed” in a green room. I made the mistake of putting him in a swivel chair and he spun around nearly the whole time. The kind of camera I use requires the subject to hold completely still. My friend who was assisting me had read his autobiography and as she recounted the events of his life he’d stand up, say “That’s right Mama!” and plop down with his legs hanging over one armrest and leaning back over the other one. Everything I see under the dark cloth is upside down and backwards. I want a relatively shallow depth of field (focus) for portraits so I backed my tripod up until the focus covered the whole chair and he could spin all he wanted and my electronic flash would freeze his image. He kept asking when the pictures would be ready and when could he see them. Finally he said his people from Greenville, FL, where he grew up, were there and he had to go. I asked him for one more and he agreed. I asked his assistant of he could stop him from spinning, which he did. So I moved the camera up to a more normal portrait distance. And there he was. Ray Charles sitting still. I thought somebody should get a picture of this. I asked him to make a peace sign. He said “A what?”. I said like V for victory in World War II. He shrugged his shoulders and his man fashioned his fingers into a peace sign. So I know it was the first time he made one and I’m confident it’s the only time because nobody has Googled Ray Charles more than I have and I watched The Blues Brothers movie again and haven’t found it.